My piece for The Wire on the assassination of journalist Gauri Lankesh in Bengaluru, that reminded me of the target-killing of my friend, activist Sabeen Mahmud in Karachi. I traced the patterns and similarity behind these murders. A spoke in the wheel of this “intellecticide” is the ‘anti-intellectual’ nature of the vote for Donald Trump who shares a host of similarities with Modi in India despite differences. The rise of white supremacy in a nation of migrants built after virtually annihilating indigenous populations is a continuation of ongoing racism in the US. The pendulum swings of history ushers in periods of the rise of the ‘Right’ or the ‘Left’. We are witnessing the rise of the militant Right at this moment with its ensuing bloodshed in India, Pakistan, the US and elsewhere. But what will continue to rise inexorably, despite bloodshed along the way, are human aspirations to basic rights, equality and justice. There is no going back, no matter how fiercely the chaddis, topis or kluxies fight it. 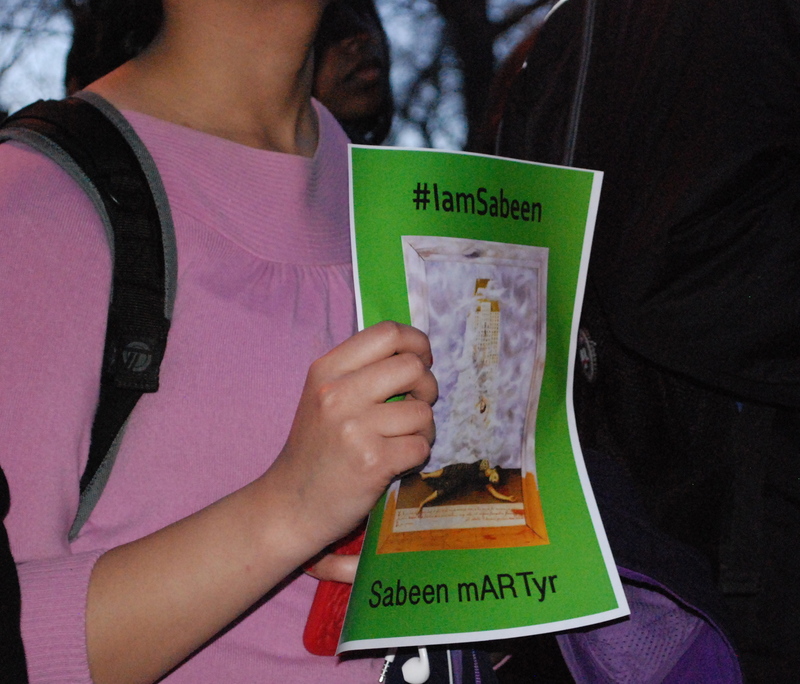 Protestors holding daily public protest vigils in Karachi demanding justice for Sabeen Mahmud hold placards calling to #unsilencePakistan and end the culture of impunity. Today’s vigil, marking give months of the Peshawar Army School massacre, also incorporates the carnage at Safoora Chowk in Karachi where armed men in police uniforms killed 45 of the 60 Ismailis on a bus. Protestors at the Fifth Global Vigil this weekend in various cities are demanding an end to impunity and against terrorism in Pakistan. Karachi – 16th May – assemble at Danish Gah, Punjab Chowrangi at 5:30pm and march to Do Talwar. Please, not Sabeen. And no, that won’t shut us up. In shock and grieved beyond words at this horrible news that our dear friend and comrade Sabeen Mahmud has been shot dead, her mother in critical condition in hospital. They were returning from the event Unsilencing Balochistan (Take 2) held at The Second Floor (T2F) [NOTE: the facebook event link posted above mysteriously disappeared then reappeared]. It was tremendously brave of Sabeen to allow the event to be hosted there given that Balochistan is essentially a ‘no go’ area. Even as we grieve our friend we refuse to be silenced. “She always spoke out. We must honour her legacy of speaking out,” said Mohammad Jibran Nasir when I spoke to him just now. “We will not let Balochistan be a no-go area”. This intellecticide cannot continue. 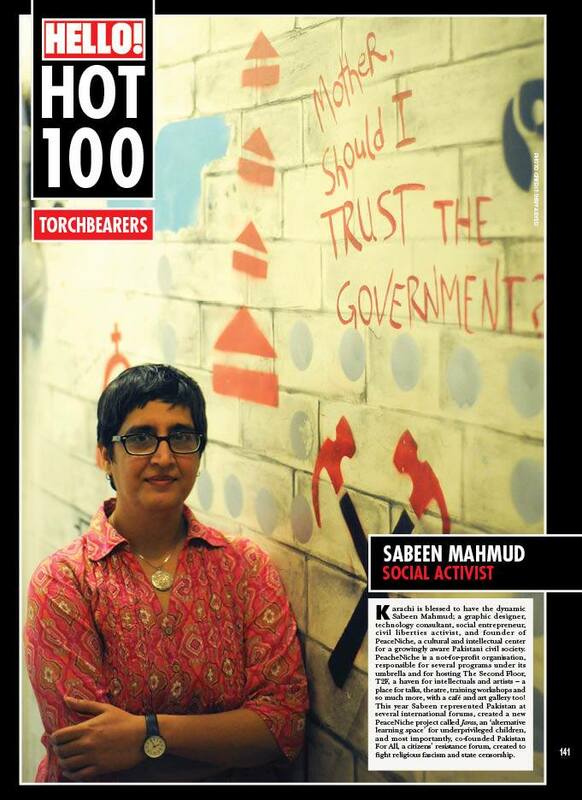 Sabeen… all-inclusive humanist, only child of her single mother, cat-lover, a gentle and compassionate soul who did all in her power to create spaces and platforms to give a voice to the less fortunate, the vulnerable, the under-privileged, those whose for whom her heart beat. Rest in peace my friend. I can’t believe you are no more. We will keep speaking out. We will honour your legacy. Communist Party of Pakistan strongly condemns the audacious targeted killing of Comrade Latifullah Khan, member CPP in village Gandigar, District Dir, Pukhtoonkhwa province. Since the start of Taliban and fanatics insurgency in Khyber Pukhtoonkhwa (ex. NWFP) province, a planned holocaust of the enlightened and educated people is underway. The sheer oblivion of the state intentionally keeps this area backward in education and development of infrastructure, which has contributed to the rise in Islamic fanaticism and jingoism (once sponsored by the state of Pakistan through its international donors from Saudi Arabia and USA and allied countries).